Oh boy, this summer has been sizzle-y! When it’s steamy outside, the last thing I want to do is get in the kitchen and turn on the oven. So what to do about supper? 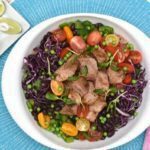 While salad seems like the obvious choice for a light meal that beats the heat of the summer, not all salads are supper worthy. What does “supper worthy” mean? Take your basic iceberg salad with a couple of cucumber and tomato slices. It doesn’t offer a whole lot of nutritional goodness and it won’t keep you energized for long. And let’s face it, that salad’s not getting top score on taste tests. 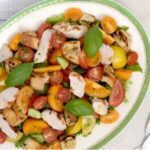 On the other hand, grilled turkey pairs perfectly with all sorts of vegetables to build a satisfying salad that is nutrient-rich and still a light summer meal. If you’re looking for flavour, a grilled turkey salad is a taste sensation! If you’re looking for a healthy option, combining lean turkey with veggies means more bang for your nutritional buck. Turkey and vegetables bring their own unique package of health-boosting nutrients. For example, turkey has vitamin B12, important for brain health. Vegetables don’t have B12, but they are filled with fibre for gut health. 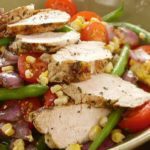 By topping your salad with turkey, you get a wider variety of good-for-you nutrients. A turkey-veggie combo creates a super food synergy with certain nutrients working together to increase absorption of other nutrients. For example, turkey naturally contains zinc and iron that are easily absorbed by your body and boost the absorption of those same nutrients from your veggies. Turkey provides high quality, hunger-curbing protein (a whopping 30 grams per 100 gram serving!) and veggies have fibre to keep you feeling full; together, both deliver even longer lasting salad satisfaction. 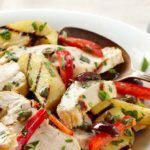 Beyond taste and nutrition, grilled turkey is versatile and can help you create quick, simple meals. Ask at the butcher or grocery store about available turkey cuts – they all work well on the barbeque. Double up! When I’m barbequing, I double (or triple) turkey and veggies so that I have enough for that day’s meal, and at least one or two more meals for the week. Makes supper prep easy peasy! We still have over a month of summer left (yahoo!). Make the most of it by enjoying a warm summer’s eve dining outdoors with a tasty, grilled turkey salad. 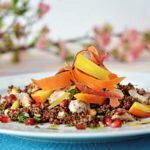 Here are five satisfying turkey salads that get two-thumbs up from this dietitian for being both nutritious and DELICIOUS!